The SkyWay Innovation Centre (SWIC) is being constructed in Sharjah for the Middle East partners to see the effectiveness of the string transport. The new Centre is significantly different from the EcoTechnoPark in Belarus. 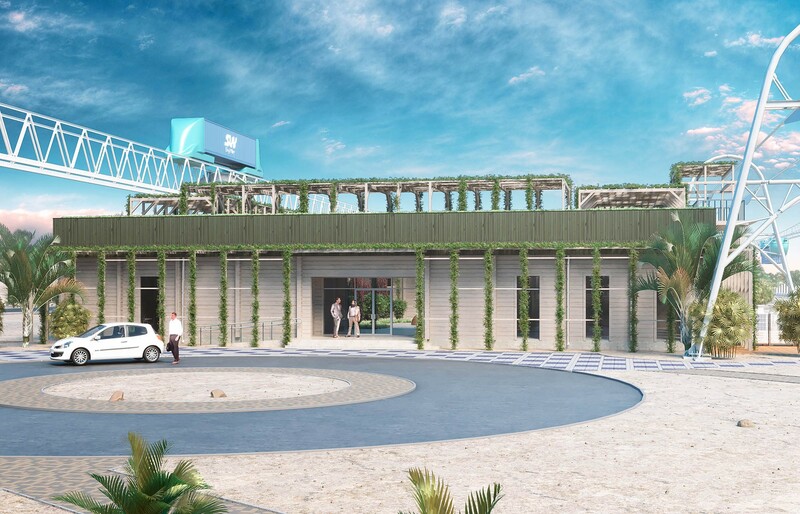 The Innovation Centre in the UAE is being built having in mind heat up to 60 degrees, dust storms that erode sea salt in the air and groundwater. The demonstration of SkyWay in Belarus is not enough to convince the customer in the successful operation of the string infrastructure in the tropics. In addition, due to the limited size of the test site in Belarus, a maximum speed of only 102 km/h has been obtained on short sections of the flyover (higher speeds on limited length sections can lead to accidents). It also cannot convince the customer that urban and freight rail-string tracks can be safely operated at speeds up to 150 km/h, and in tropical conditions, since the safe length of the test tracks in this case should exceed 2 km. The test sites built in Maryina Gorka were not initially designed for heavy rolling stock with the weight of about 50 tons (this is the weight of a heavy tank), but it is these large loading capacity and passenger seating capacity vehicles (trains for 300 passengers and more) that are of most interest to our Middle Eastern partners from a number of Gulf countries. The new technological base of the project is one of the components of the big game on the implementation of the SkyWay transport solutions in the infrastructure of the rich and rapidly developing region. The local partners not only express an active interest, but also attract potential customers from other countries. As reported by the official News Agency of the UAE, the Head of the Dubai Transport Ministry told Anastasia Palashchuk, Minister of Trade of the Australian state of Queensland, about the prospects of using SkyWay transport to increase the share of automated transport during the meeting with her. The SkyWay Innovation Centre in Sharjah is a research and production cluster, which will feature urban and freight transport complexes of all types: mounted and suspended, monorail and bi-rail, with a flexible, semi-rigid and rigid track structure, fundamentally upgraded and improved ones, that is, the next fifth generation of the rolling stock. In the framework of SWIC, there will be tested and certified new vehicles and infrastructure solutions, including a fragment of the linear city with high-rise towers; and there will be created SWIC's own research laboratories and scientific and technical base with its certification centre. In addition, in the future, the Centre is to become a part of SRTIP infrastructure, i.e. 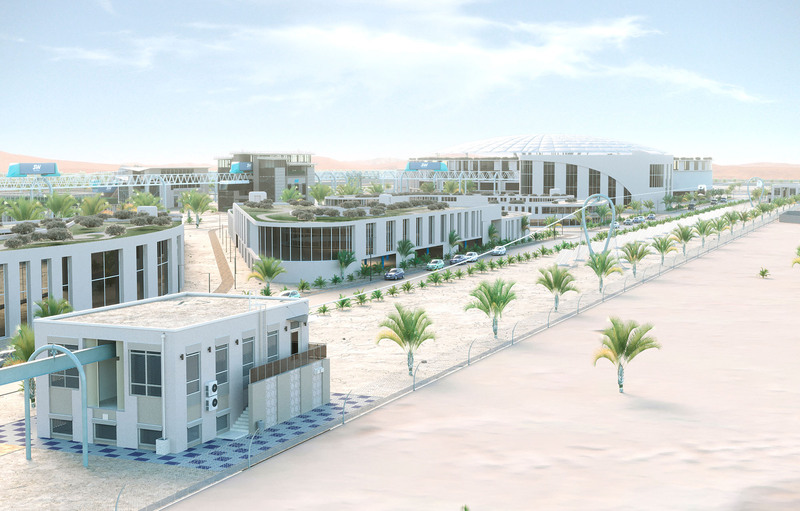 Sharjah Research Technological Park, which the Centre is the part of. Not only the already proven rolling stock at the EcoTechnoPark, but also a new range of electric vehicles, urban rail and freight systems will be presented in Sharjah Innovation Centre. At the first stage, among the novelties, there will be a passenger four-seat Unicar U4-431-01 in VIP-version and a freight Unicont, designed to carry 20 and 40 - foot containers. In the future, it is planned to expand the range of the rolling stock with new suspended and mounted vehicles of greater loading and seating capacity, capable of demonstrating a greater cargo flow (up to 200 million tons per year) and a greater passenger flow (up to 50 thousand passengers per hour). There will be presented different types of track structure and supports at the Innovation Centre. They differ not only visually (for example, for Dubai, the aesthetics of infrastructure facilities is one of the main requirements), but also in loading capacity, material intensity and construction technology. Large spans of up to 1,000 m will be also presented. In addition to a fully-functional test sites, on the territory of the SWIC, there will be implemented the full-fledged infrastructure of urban complexes, up to the boarding stations, turnstiles and the system of ticket purchasing. In order to ensure the possibility of developing a network of the string roads in the region and around the world, there will be carried out research and development work on the basis of the Skyway Innovation Centre. A Competence Centre, which will train specialists for the design, construction and operation of the string transport is to be created at the American University of Sharjah and Sharjah Innovation Research Technological Park. The first phase of SWIC construction is building the first section with the flexible rail-string flyover and 100–200–100– metre spans. This is an analogue of the flexible track at the EcoTechnoPark. The flyover and infrastructure of this complex has been significantly upgraded: there were taken into account its minor «children's diseases», characteristic of the first samples of the technology. Besides, the first phase of the construction includes the innovative residential module (Ecodom - [EcoHouse]), embodying a number of original environmental technologies. In addition to demonstrating the new concept of organizing living space, it will be used as a Project Headquarters in Sharjah, welcoming delegations and so on. The same stage of the construction includes laying communication lines, the construction of secondary buildings, checkpoints and driveways, necessary for work in the further stages of the Innovation Centre development. Unicar U4-431-01 will become the first vehicle to be demonstrated. Its preparation for shipment from Belarus to the UAE is coming to an end: most of the necessary test and certification trials have already been carried out. This type of vehicle can carry passengers at speeds up to 150 kilometers per hour in comfortable environment, with fuel consumption per passenger being of 0,61 kW&h or 0.16 litres of fuel per 100- km distance, which is an order of magnitude less than that of an average car. In the new tropical version, among other things, there will be a more powerful cooling and climate control system capable to maintain inside the vehicle's salon plus 20-degree temperature when there is sixty-degree heat outside. What difficulties have been overcome and what experience has been gained? The company has brought to the United Arab Emirates a huge range of non-standard solutions that require appropriate adaptation to local legal norms before their implementation. Naturally, in such a developed country as the UAE, it is easy and fast to build standard skyscrapers. But, for example, the SkyWay wooden Ecodom [Ecohouse] will be the first (!) wooden house in the Arab Emirates. The construction from renewable resources, according to its characteristics corresponding to the highest requirements of ecology and comfort, was previously impossible in this hot country because of the requirements of fire safety. But «String Technologies» in close cooperation with local partners managed to agree and start the construction of this project. Perhaps, this will set a new trend in architecture in the Middle East. And that's just the house. 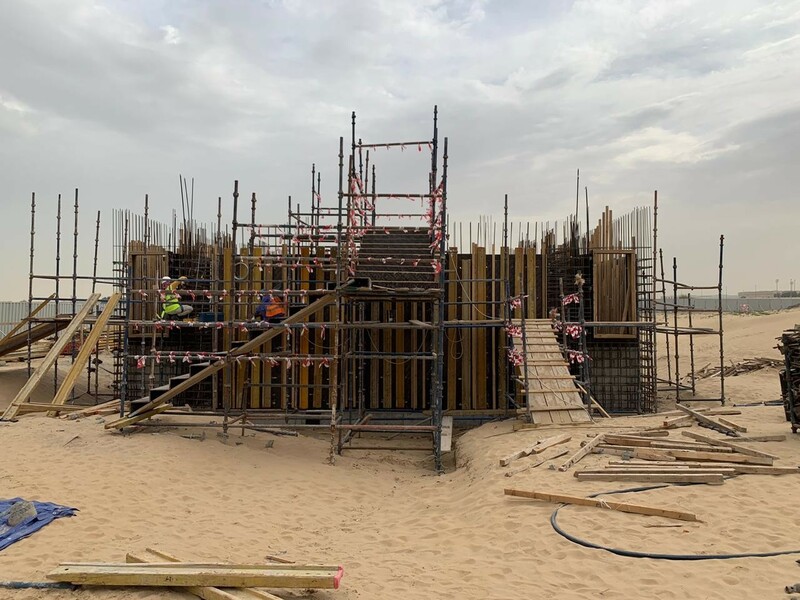 From minor details to large elements of the project, from the unusual British sockets and separate water pipes needed in the UAE for religious reasons, to the construction of supports and tracks – all that requires additional elaboration and coordination with local authorities. This is a lot of work, which the staff of «String Technologies» together with the colleagues from the UAE have coped with in an incredibly short time. 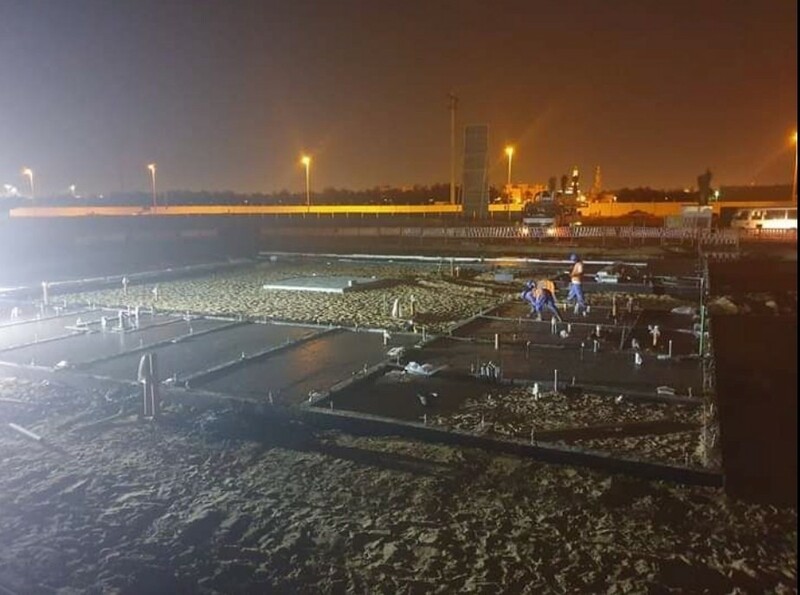 The construction in the UAE itself is tremendous and necessary experience for the further advance of the company. «String Technologies» has already adapted well to work within the framework of the European requirements relevant to Belarus. In the Arab Emirates, there are radically different British and American requirements, and all working documentation, respectively, must be in English. Having learned to work within this legal framework, our specialists can now work speedily in almost any country. Today, two stations, combined with anchor supports, are being actively built; two high-rise intermediate supports of the original design are already prepared for installation. The work is carried out by local contractors under constant supervision and with the support of «String Technologies». The flyover with the flexible rail-string track structure can be built quite quickly, and in Sharjah, this is being demonstrated in practice: the agreed terms of work are observed, despite the new conditions for the company and agreed with the customer half a year-shift in start of works. The construction of the first line of the new Park is planned to be completed by the end of May – early June. The Arab partners and potential customers will be able to personally test the Skyway passenger transport, which was created specifically for them in a short time. The customers will see a real infrastructure project with all the necessary elements in the tropical design and not a demonstration site. In just over a year, since signing of the first agreement until the completion of the first phase of construction, CJSC «String Technologies» has developed the completely new transport flyovers (three types of pre-stressed non-cut ones), infrastructure of the «second level» (three types), and the rolling stock (a few models of rail electric vehicles), adapted to the difficult climatic conditions of the UAE. At the same time, the process of the construction of the first urban complex took a small part of this time. 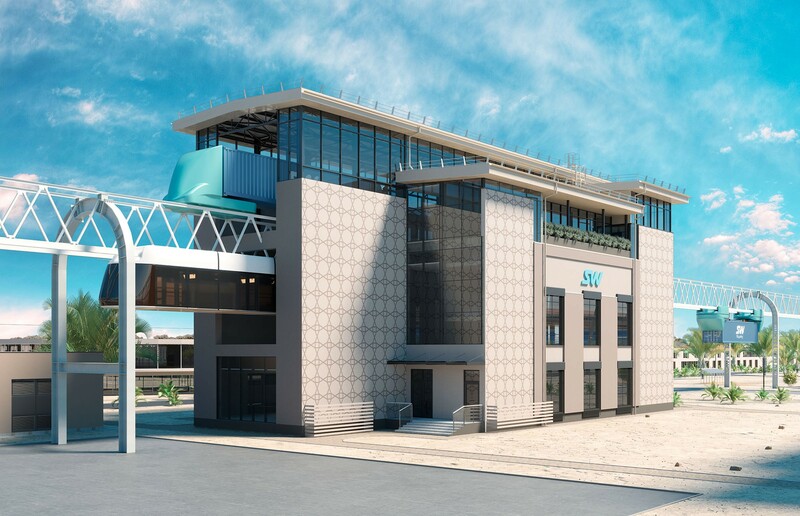 At the SkyWay Innovation Centre in Sharjah, four more complexes (one cargo and three cargo-passenger ones) for the suspended and mounted rolling stock will be built at the next stages of the construction. Among the novelties, there will be vehicles with more loading capacity, for example, the Unicont for transportation of sea containers weighing up to 35 tons; the Unitruck with a capacity of up to 25 tons, as well as articulated Unibuses with a capacity of more than 300 passengers. The Center will soon have functioning passenger and freight stations, depots for servicing vehicles and other facilities. SkyWay promotes an integrated approach: among the developments, there are urban electric vehicles, which arise keen interest at the exhibitions, and drones with large loading capacity, which we will tell you about soon. All these seemingly non-core developments are organically integrated into the ecosystem of the Skyway transport and will provide a wide range of transport services. The hardest work in the UAE has already been done: the business contacts have been established, the string transport and related solutions have become familiar to local specialists. It means that the construction will go even faster. Further on, there will be the SkyWay University, commercial lines, urban and intercity transport networks of the string transport, linear cities. Much of the planned still remains classified.